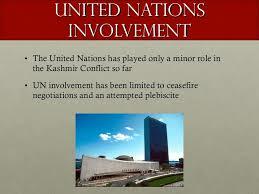 UN involvement on Kashmir issue lasted for 23 years. In these 23 years UN passed 23 resolutions on Kashmir but the case is still in pending. It is one of oldest unresolved issues of UN. The first debate on the issue of Kashmir in UN was started with Kashmir question when India first brought Kashmir issue in UN assembly blaming Pakistan for creating turmoil within the boundaries of Kashmir on first of January 1948. List of important resolutions passed by UN on the issue of Kashmir is enlisted below. This resolution was passed by 9 out of 11 member quorum of UN. Remaining two did not oppose the resolution but were found absent. In this resolution, the UN tried to convince both players for mutual cooperation to figure out this issue. In this resolution, the UN decided to make a committee of three members choosing one-two from both Pakistan and India and one on the side of UN. After the failure of UNCIP (united nation commission for India and Pakistan) UNCIP was decided to replace by a single member who was Dixon a special representative to Kashmir question. He was given the task to collect information regarding this issue. He reached India and worked on it. Taking a deep study of this issue to moved back to UN in 1950, concluding that there would be a referendum in the areas which are deemed conflicting. hope after reading above resolutions you are clear about the Role of UNO For Resolving Kashmir Issue. After Dixon plan, several proposals had been presented for Kashmir issue but none of them got finalized. After the 1965 war UN also tried to find some agreeable solution but in vain. Again after the war of 1971 UNO came between the two parties to resolve the issue but it was not concluded accordingly. This was the last ditch effort which UNO dared to make for Kashmir issue. With the failure of this effort era of UNO (1948 to 1971) twenty-three years involvement ended with zero results. Although this issue could not be resolved by UNO this at least injected in the brains of two countries Pakistan and India that Kashmir was a disputed territory. It has swallowed about thousands of lives and atrocities are going with heated pace. It should be resolved with only mutual terms so that people of Kashmir may inhale a sigh of relief.